Paperback true-crime author Olsen thoroughly combs the Sunshine Mine fire of 1972, a disaster that claimed 91 lives, for both the terrible facts and the human interest. 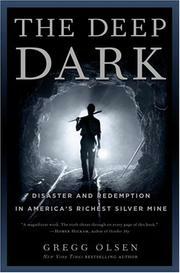 In a hardrock silver mine such as Sunshine, he writes, fire was an unlikely hazard. So when wisps of smoke began to work their way through the shafts, it didn’t alarm the miners, who thought it was probably a small flare-up that would soon dissipate. That would not be the case, Olsen reveals in this near blow-by-blow account. The smoke soon became thick as sludge and was followed by a sharp spike in carbon monoxide, a few good whiffs of which dropped the miners where they stood. This carefully braided story weaves profiles of the men—hard and bitten as nails, fiercely loyal, and, though wise to the ways of rock under intense pressure, not exactly cautionary by nature—into the chronicle of the disaster’s progress. An evacuation got half of the them to the surface, but many of their brethren suffocated in poisonous gas. Astonishingly, two men way down at 4,800 feet survived for a week after they found a clear patch with water. Nasty scapegoating of the men by the mine owners and the Bureau of Mines ignored the fact that the principal culprit was a flammable urethane foam already banned in England. Olsen’s narrative is brisk and often grim: “One crewman had to puncture a corpse with a pick to drain the gases and fluids so it could be put into the bag.” Wisely, however, he chooses not to whip the morbidity into a froth. He also details the consoling, positive fallout from the tragedy: the creation of the first federal agency solely responsible for mine safety and an array of new rules to preclude the obvious failures at play in the Sunshine incident.